*La disponibilidad puede variar – por favor llama a tu tienda local para verificar si tienen el producto en existencia. 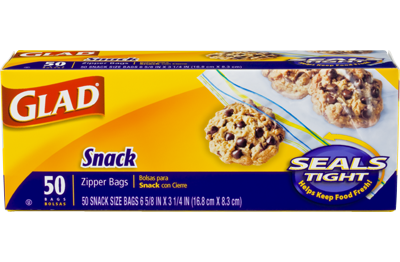 ​Las bolsas Glad® Food Storage Zipper Bags están listas para todo. Gracias a un cierre extra ancho que siempre sella bien, estas bolsas resellables ofrecen la protección perfecta para una variedad de artículos en tu refrigerador o alacena. ¡También se pueden usar para guardar ropa fuera de temporada! Rated 5 out of 5 by Jay from Jay This product has great features. 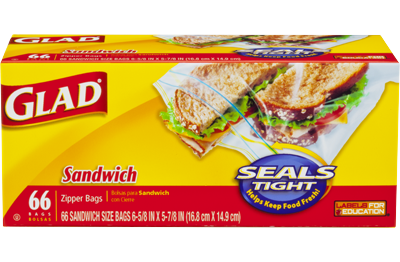 i like the different sizes from sandwich bags to freezer bags . The keep food fresh and the quality is excellent. I have never had any of them to leak. The plastic is just the right weight, not too thin, and they are easy to open and close. I would recomment to everyone. Rated 5 out of 5 by Deelucylou from Handy Easy to use and date, keeps everything fresher longer & organized . Rated 1 out of 5 by UnHappyConsumer from Terrible! 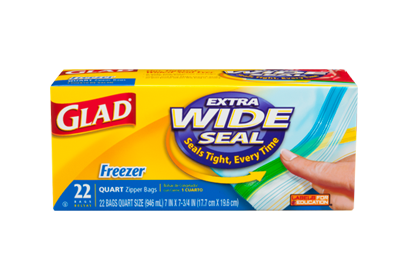 Wife bought a box of Wide Seal ziploc. Neither one of us could get them to seal... Worthless! Cheap no name brand was easier and better than this product. Avoid like a plague. And no, it wasn't just one bag, it was the entire box. Rated 5 out of 5 by emhk13 from alternate use for zipper bags I use the gallon sized zipper bags for my knitting. It is just the right size to use as a project bag for a pair of socks, It holds my yarn, my needles, a tape measure, a used prescription pill bottle for my tapestry needle and my stitch markers. I also photocopy my patterns so I can fold the peice of paper in quarters and put in the bag with the project. Every thing in one place, just the right size to tuck into my purse and it stays clean. Better yet they are reuseable. As soon as I finish a pair of socks, I replace the yarn and pattern and start over again. Rated 4 out of 5 by Anonymous from stores more than food There are so many things besides food that can be stored in a storage bag. My granddaughters favorite is mud and worms!! Rated 5 out of 5 by LAS VEGAS BRIDE from SMART WAY TO SAVE... THIS PRODUCT IS AN EVERYDAY USE IN MY HOME, DONT THINK I COULD LIVE WITHOUT IT !!! Rated 4 out of 5 by Lu from good product This is a fairly good product,but a lot of the times the zipper falls off.